To meet the increasing demand for biologics worldwide, you need to expect more from suppliers. It isn’t just about the products we deliver, but how we do business together. With a collaborative approach that is grounded in our technical knowledge, we work with you to achieve optimal bioprocessing outcomes. Committed to identifying the technologies and services that address your needs, from drug development through large-scale commercial production, we provide integrated and tailored solutions that improve the overall biomanufacturing experience. If a solution doesn’t exist, we’ll build it—together. And while we are flexible in our approach, we are uncompromising in our pursuit of performance. Through technical engagement, innovative product design, and strategic sourcing programs, we deliver productivity, quality, and assurance of supply so that you can have complete confidence in the efficiency and speed of your biologic development and manufacturing processes. 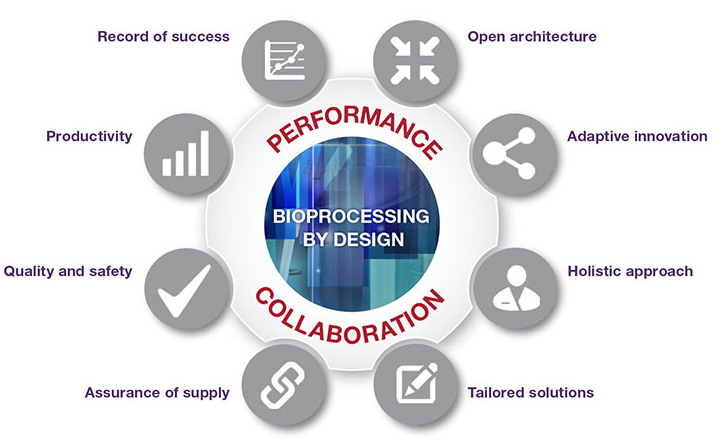 That’s our commitment to you and it’s what we call Bioprocessing by Design. Thermo Scientific™ single-use technologies: End-to-end solutions with an open architecture approach. 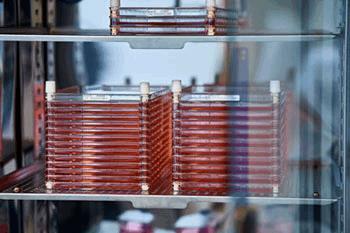 Gibco™ cell culture: Recognized worldwide for superior quality and consistent results. Purification solutions for even the most complex biopharmaceuticals. Applied Biosystems™ analytical and QC testing: Rapid molecular methods for pharmaceutical manufacturing. An overview of Libbs product portfolio and how they benefit from Thermo Fisher Scientific services. Automate the detachment of cells from Nunc Cell Factory Systems by using the Nunc Cell Factory Shaker System. Mobile solution for the incubation of Nunc Cell Factory systems, available with and without CO2 control. Specifically designed to lend innovation and efficiency for highly-effective upstream or downstream applications in large-scale cell culture and production of vaccines, cell therapeutics or other biological products. The Thermo Scientific™ HyPerforma™ Single-Use Fermentor (S.U.F.) was designed to meet your unique and rigorous needs for microbial applications, while maintaining the flexibility, ease of use, and efficiency found with our single-use systems. The HyPerforma S.U.F. and Thermo Scientific™ BioProcess Container (BPC) system use traditional stainless steel fermentor engineering principles to meet the high demands of industrial microbiology with efficient mass transfer, mixing, and temperature control. The Thermo Scientific™ HyPerforma™ Single-Use Bioreactor (S.U.B.) is one of the most widely used S.U.B.s designed for mammalian cell culture. As a superior solution, our bioreactors can be easily integrated with any controller available in the market today. This video animation details the benefits of the Thermo Scientific imPULSE Single-Use Mixer and illustrates how to use these mixers in an upstream and downstream mixing application. This video animation details the benefits of the Thermo Scientific HyPerforma Single-Use Mixer and illustrates how to use these mixers in an upstream and downstream mixing application. The Single-Use Bioreactor is ideal for all upstream cell culture applications including small-scale process development, scale-up and cGMP manufacturing, flexible batch or fed-batch processing, and continuous bioprocessing. For process development, such as in a seed-train environment, depending on the seed ratio, the Single-Use Bioreactor is available in a wide range of sizes, from 25 liters to 2,000 liters of working volume. The HyPerforma Single-Use Bioreactor enables optimized mixing and performance across all bioreactor sizes, with a 2 to 1 standard turndown ratio, or a 5 to 1 turndown ratio system available upon request. Proven solutions for large-scale production of cells, vaccines, and cellular therapeutics, these systems have the same growth kinetics as laboratory-scale cell culture products. The ports of the system make it easy to customize and close with custom tubing assemblies that facilitate venting, filling, and harvesting. Maximize productivity with automation solutions for scale-up of your Cell Factory systems. Automation solution options include Automated Cell Factory Manipulator (ACFM), CO2 Incubator, Shaker and Shelving Systems.